STELLUX is a trademark of Swarovski Aktiengesellschaft. 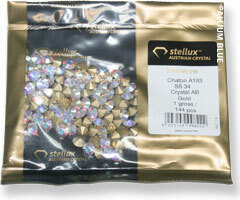 STELLUX™ offers a number of distinct advantages over crystals from other suppliers. Made according to a high-value lead-free formula, STELLUX™ is undeniably one of the longest lasting crystals in its category. Its advanced foiling withstands harsh manufacturing techniques such as soldering and electroplating, and offers high resistance to environmental influences such as water, chloride, or chemicals found in perfume, hairspray, and other cosmetic products. STELLUX™ is available in a broad range of sizes, colors, and effects, with striking color consistency throughout the entire assortment. STELLUX™ chatons are also available as semi-finished products such as Plastic Trimmings and Chaton Montées.